ED#28 : Breaking Through The BIOS Barrier! 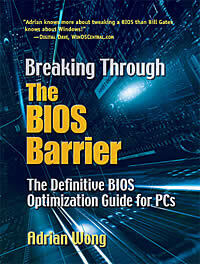 I'm proud to announce that my book, Breaking Through The BIOS Barrier : The Definitive BIOS Optimization Guide for PCs is now available for sale in bookstores near you! The book is 368 pages thick and will cover many topics on the BIOS. It won't just be a compilation of the BIOS feature descriptions in our online BIOS Optimization Guide. This will be a complete guide on how to optimize the BIOS and how to recover from any problems that may occur. The back cover shows a short description of the book as well as a few accolades. The cover sleeves will show more accolades. No, no picture of me here. I am not that pretty. Putting Brad Pitt's picture would really sell the book but that would be against the law, wouldn't it? Value Added Feature (For Print Only) : Comes with a FREE 3 months subscription to the complete online BIOS Optimization Guide! In America, this book can be purchased at your favorite local bookstore or online bookseller, electronics stores, and computer stores. To locate a bookstore near you, please visit the American Booksellers Association web site. We will also be directly selling the book to those who cannot buy them from the online retailers above as well as your local bookstore. Although the book is already much cheaper over here at only RM 91.50 (USD 24), we will be giving a further 10% discount for those who buy directly from us. Therefore, our price will be RM 82.35 (USD 21.67). But please note that the final price you pay will depend on the cost of postage and packaging. If you wish to purchase the book directly from us, please write to me at awsh @ rojakpot.com. "Been waiting for a book like this forever! Finally, someone wrote a book on the BIOS and what a great book this is! Incredible amount of information on the BIOS and its settings! I can't believe it. I've thrown all my manuals out the window. This is the only book I need now. If you are in the IT support line or just enjoy playing with computers, this is a book you must check out. It sure solved all my BIOS issues!" Lewis Keller, Mushkin Enhanced Memory Systems, Inc.
"Breaking Through the BIOS Barrier solves all that by providing easy-to-understand, layman's descriptions for all of the latest BIOS settings. Combining these descriptions with real-world reasons for choosing certain options makes the guide an invaluable resource to any computer "tweaker" or enthusiast. For the advanced user and the curious, the book is full of technical information that delves deeply into the mysterious and uncharted waters of the modern BIOS setup. Memory timings are an extremely important part of performance and stability in today's high-end computers. 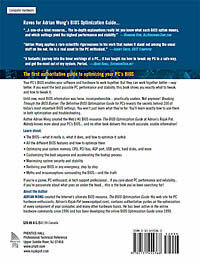 At Mushkin, Adrian Wong's online BIOS Optimization Guide (http://www.techarp.com/bog.aspx) has helped us give accurate, bleeding-edge suggestions to our customers to increase performance and stability. It has been an indispensable tool for our technical personnel to use in R&D and troubleshooting. "Adrian Wong is one of the few really devoted scholars in the field of computer hardware. He applies a rare scientific rigorousness to his work that makes it stand out among the usual stuff on the net. He is a real asset to the PC enthusiast." "By far the best BIOS Guide there is." When you are starting your computer if you hold down F8, or the DELETE key or perhaps some other key, you get into the BIOS setup routines. When you look at these screens you are presented with a bewildering array of optional settings. They are all, of course, clearly identified with some kind of gibberish like AGP to DRAM Prefetch. This book is organized so that inside the front and back covers are a listing of the BIOS options. Looking up AGP to DRAM Prefetch you are told that there is a Quick Review on Page 40 and a Detailed Description on Page 169. And after a little reading you will understand what this option does, and why you probably want it enabled. About 250 BIOS options are explained in this manner. There have been many times in the past when having such a book would have been invaluable. It is clearly written using words that will make sense to the computer literate and those maybe one step above novice. This book is for advanced users only and not for the curious. If you don't know how to get into the BIOS on your computer, and what BIOS stands for then this isn't the book for you and should be left well enough alone. It is true that Adrian makes it sound simple but if you don't fully understand the changes your making, you could seriously screw-up your computer, and the reason why companies like Dell make it harder to accidentally access the BIOS on startup (crtl+alt+del) and not the friendly one key press on enthusiasts' systems. I know that most of the people buying this book know this already but after reading the first review I felt a little caution should be exercised and not make it sound like it's as easy as operating a microwave. I'd like to congratulate the author of the BIOS Optimization Guide. This is absolutely marvellous. I was looking specifically for advanced information on the AGP Aperture Size setting and you guys have got TEN paragraphs on it. "The BIOS Optimization Guide is a one-of-a-kind resource that I refer to anybody who wants to tweak their computers to run the best. And I wouldn't refer others to something I wouldn't use myself. I've referred to the BOG countless times as I upgrade my BIOS or get a new motherboard. The in-depth explanations really let you know what each BIOS option means, and which settings these options yield the highest performance and stability." "Adrian knows more about tweaking a BIOS than Bill Gates knows about Windows. Short and sweet: If you own a computer you need to know about the BIOS; and Adrian is flat-out the authority when it comes to understanding, configuring, or tweaking a computer's BIOS." "The BIOS is the basic input–output system of any computer that defines how the individual parts of the hardware are interacting with each other. Many of the parameters are completely transparent to the user; however, there are others that are user accessible and allow customizing the performance depending on the individual needs and the choice of components in the system. What was a myth-surrounded part of any computer only some 5 years ago has been largely decrypted by now, mostly due to efforts coming from enthusiasts. Any guide like this will offer invaluable help not only as a reference, but also for troubleshooting of personal computers." "If you ever wanted to know what you can do with your BIOS, Adrian has it covered. Being an admirer for more years than I can count, the BIOS Optimization Guide is a fantastic journey into the inner workings of a PC at the root level. It has taught me how to tweak my PC in a safe way and get the most out of my system. Period." "It is the one piece of the system that is powered continually—even when the computer is unplugged. It is the first program that runs on start-up. Without it, no operating system would install. It is the first component that requires configuration. It is the first feature that requires your attention. It is... THE SYSTEM BIOS. The very first procedure to be performed on a newly assembled computer system is to ensure that the system BIOS is up-to-date. This procedure in itself can be clouded in mystery and present some trepidation for the average user. Then comes the Black Art of BIOS configuration. Has the BIOS detected the hardware correctly? Is there some hardware that should remain disabled? What do each of the BIOS settings mean, and more importantly, what do they do? Whether you are planning to build a new system or merely upgrade an old one, it is advisable to have some knowledge of the system BIOS. The Definitive BIOS Guide from Rojak Pot represents one of the most complete resources for BIOS configuration currently available. Check it out!" "The BIOS Optimization Guide is a truly useful resource for those looking to get the most out of their systems. I often point people to the BOG to learn more about memory timings and what they mean." "95% of all Bios optimizations that I now know I learned from Rojak Pot's guide. And so did everyone else. If they tell you different, they are not telling the you the truth or they read it on a site that stole the information from his." "Whether you are an overclocking uber geek or a first-time computer user, Adrian's BIOS Optimization Guide is a must. I can truthfully say that 90% of what I have learned about BIOS optimization has been through the use of Adrian's guide. Why else would I refer to him as 'The King of the BIOS'?" "Adrian has done the tech community a great service by making this guide. It has personally saved me time on both repairs and evaluations. With BIOS options as numerous as they are today, it's wonderful to have a one-stop-source to decipher them all." "You know, I couldn't count the amount of times I've referred people to your BIOS Guideelit's very informative, and saves me the time of explaining why people should disable Video BIOS Shadowing, why Fast Writes isn't such a big deal for today's games, and much more." "Just wanted to say thanks for saving me time and also helping me out. (I learned a lot from it, too!) Keep up the most excellent work." "...this isn't so much a Knowledge base but a labor of love. Not only has this guide had a place in both Titch's and My Favorites for many years, but I'm really excited to see it still going after many, many years. Well done, Adrian. Keep up the excellent work." "Adrian Wong of Adrian's Rojak Pot has been building up his BIOS Guide since late 1999. Today, he hit version 6.0, and the guide is now comprehensive in its scope. It comes highly recommended from me due to the fact that BIOS optimizations can yield positive results in performance and compatibility for everyone. Adrian also goes into far greater detail than even your best motherboard manual and even debunks some "myths" that some manufacturers still propagate." "This is one of the most comprehensive and user-friendly guides I have found to date. I was able to do various tweaks with my mem/cpu that increased my overall system performance by about 15%. Many of the BIOS tweaks will depend on your mobo and whether certain options are even available in your BIOS menu. However, I do recommend that even ppl that aren't familiar with working with the BIOS give it a go with this guide... Really helps to answer all your questions." "Some bookmarks occupy space in my Favorites folder just in case I need such a resource in the future, but others are frequent visits. I can easily see this one being a resource to which I refer often. This site contains very good explanations of the numerous configuration options you see in the BIOS. ...this truly is a link you'll want to keep around. This one is already sync'ed to my iPaq!" "This is the most comprehensive BIOS Guide available. Just about every option in a modern BIOS is explained. The best performance setting is usually pointed out, and the explanations are easy to follow. A must for any overclocker wanna-be."